You were taught that gases and liquids could not exist beyond some 15 miles into the Earth’s crust due to the pressure and supposed temperature gradient. Certainly no life forms existed at any depth beyond a few thousand feet, bacterial or otherwise! Water was the result of precipitation and perhaps planetary deposition! Aquifers and subterranean waters were replenished from above and that water coming from the Earth’s bowels, as evinced by many mythologies, was a childish delusion! You were taught photosynthesis (i.e. the sun’s energetic light on chemical mixes) was the only method by which life on earth could slowly evolve, creating hydrocarbons, carbohydrates and all the trappings of modern life over billions of years! Above all, you were never referred to the incredible hold that electromagnetism, in all its forms, influences every volumetric acre on Earth, both in times of Chaos and in times of relative tranquillity! The part it plays in weather, earthquakes, volcanoes, tsunamis, life and thought itself were rarely considered in your education. These geological paradigms were fought over by pioneers such as Hutton and Lyle and, certainly, in opposing forces by practical scientists such as Cuvier and even theological theorists such as Bishop Usher until a certain “age of reason” reached a fashionable scientific “consensus”! Often this was by arbitrary divisional voting within the Royal Society. Such is the nature of man! Of course once reached, the “converts of dogma” demanded loyalty! An insight is that it takes at least a generation or two before these once thriving “monopolistic truth paradigms” are overthrown! But enough! Despite our great explorations into space, with all its contentious scientific issues, perhaps “the Electric Universe’s” greatest mystery lies beneath our very feet. Thoughtful revisionist pioneers, such as Thomas Gold, have begun to question the interpretations of these dogmatic geological schools of thought! Let us begin with a question! How homogenous is the earth? Is it moulded within by strict boundaries or is it perhaps like the illustration of the internals of a classic thunderegg with a 3D star shaped interior? Plasma pioneers, such as C.J Ransom, recreated spherical Martian rock blueberries in the lab with electrical discharge techniques. Were thundereggs created by similar means? And if electrical effects are scalable could our larger earth body perhaps replicate a thunderegg formation with its gaseous enclosures and spiky outreaches (see illustration) that may, perhaps, resemble the jets of a comet? To take this further Thomas Gold, recently noted by Mel Acheson, in “The Deep Hot Biosphere”, makes a strong case for the intervention of gas upwelling as a powerful, but neglected, process in the workings of large hydrocarbon deposits (gaseous, liquid and solid) from deep within the Earth. But perhaps even Gold failed to realize the effect of electrical telluric currents, swayed by cosmic effects, as the primal cause of the chaotic meandering of gases and liquids? Were they the agent that caused instabilities? As Wal Thornhill has always pointed out, the Earth is an electret, or charged body, revolving in a constantly changing cosmic electromagnetic environment! It thus reacts with other charged bodies working towards electrical equilibrium! Chaos theory demands adjustment to outside attractors as it relentlessly adapts to the curious inbuilt need for harmony! This applies not only to the immediately apparent magnetosphere but to factors deeply within the bowels of the Earth. All very well but where do we go from here? Next on the agenda is an interview with geologist Louis Hissink, that inveterate discoverer of diamond pipe formations in the Kimberleys of Australia. His EU enlightenment enabled him to combine Aboriginal mythology with Peratt instabilities and lead him to wilderness where dramatic events had formed a lead to deep earth penetrations that formed diamonds. Gold veins, coal fields, natural gas, petroleum! A time for new theories based on geological observation not fairy tale theories. A final thought. Look at that thunderegg again! 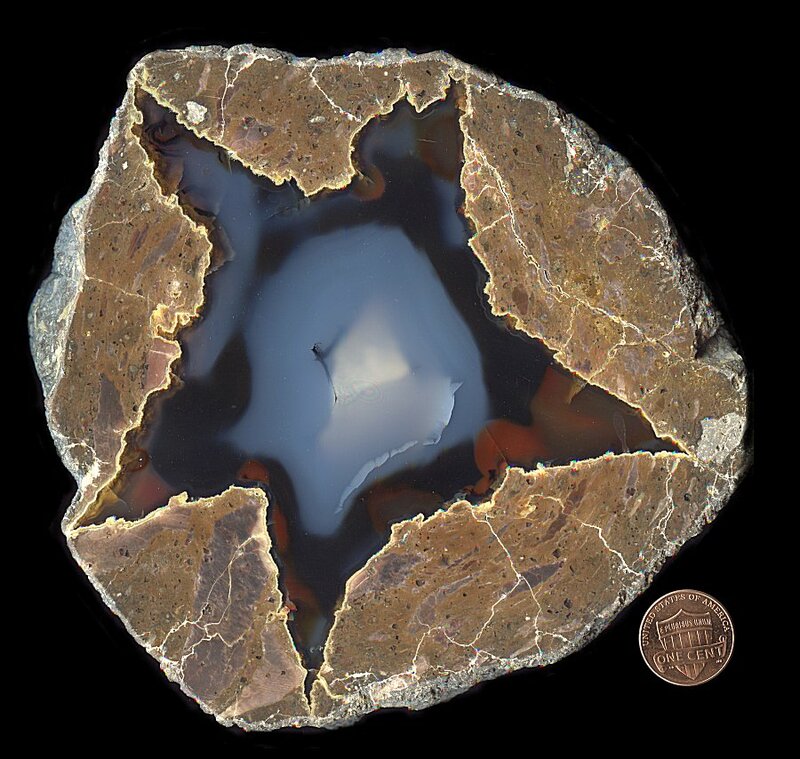 A thunderegg, in my opinion, is the result of an electrical z-pinch. This has been covered in previous videos on the thunder crab rock phenomena. What if Earth was formed on a similar scalable electromagnetic paradigm? The film in part two will again ask questions that I suspect no one can answer but at the least demands that what you were taught be not only questioned but radically revised. Visit the www.mungoflix.com site in preparation! I’ve never heard of a thunderstar before! It would be cool if the inside of the Earth looks like that.